Arts and crafts supplies come in all shapes and sizes from very small to very large. Crafting supplies can end up all over the place in your home or crafting area causing the area to be cluttered and organized. A messy craft area makes it harder to find the craft supplies that you need when you actually need them! A person will be more productive with their craft projects when they are working in a clean, comfortable space with all of the supplies visible and accessible. Every home has an arts and crafts area for children’s projects and hobbies. If there is not enough room in the home for arts and crafts storage, then it is time to consider renting a self storage unit. Stop N Stor offers a variety of storage solutions from climate controlled to non-climate controlled storage units. A 5×5 storage unit would be ideal to store arts and crafts supplies. If you require a larger storage unit for your arts and craft, use our storage space calculator to help you estimate what storage unit size you need. Adding shelving units in the storage unit will make the supplies even more organized and easy to find when you need access to them. Now is the time to organize your craft supplies into one specific area; before you know it, it will be time to start working on holiday craft projects. If possible, create a crafting corner or desk in a room. This will allow for place for you to work with all or your supplies close by. Before you start a crafting supply organization project, take inventory of the items that you currently have at your home. This prevents overbuying items that you do not use. This is also a handy shopping list when you do need to re-fill your supplies. It is very important to keep “like” arts and crafts items together. Each type of supply should be sorted to be with like items. For example, do not mix pencils and markers, but keep them separate. Specific tools, such as stamps, scissors, rulers, etc. should be kept with like items. Use plastic storage bins to store your craft supplies, so you can see what is in the bins. Label the bin on the lid and side with the types of supplies, so you can easily find what you need. Plastic bins can come in all shapes and sizes such as specially designed bins for bead storage, rubber band loom bracelet supply storage or stamp storage. Plastic bins are also much easier to stack on shelves. 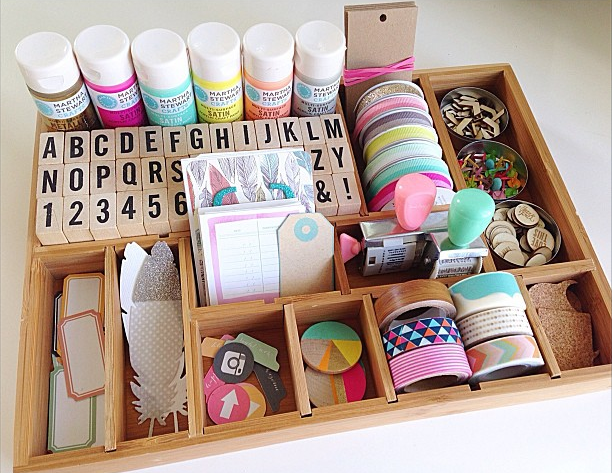 Scrapbooking supplies can take up a lot of space. Have enough space so you can store and keep all of your scrapbooking supplies. Make sure that you have all the supplies that you need on hand including stamps, stickers, photo albums, glue sticks and of course, photos. Pinterest is a great place to find storage ideas for your home crafting area. Buying storage solutions at your local craft store or creating your own DIY solution for your crafts will make it easy to find what you need when you need it. It is hard to believe that August and September are back to school time for colleges in the Savannah area! It seemed like the summer went by way too quickly! Some local colleges start their classes very soon! South University is the first to get started back to school with the fall semester starting August 6th. Savannah State University students head back to classes on August 10th. Armstrong State University students and faculty start classes on August 17th and Savannah Technical College’s many local campuses, including one in Liberty County head back to classes on August 24th. Savannah College of Art & Design (SCAD) will start their classes on September 14th. College students have different challenges than elementary through high school kids. Freshman year for college students is a year of challenges, adjustments and fun experiences. One of the biggest challenge for new college students is adjusting to sharing a dorm room with one or more roommates. Dorm rooms can be very small, some averaging only 300 square feet, so any type of storage space should be optimized. We have mentioned that storing college items is a great option for college students and faculty for the summer months or if they are away from campus doing internships, co-ops or working away from campus. Actually, a self storage unit is a terrific year-round student storage solution for extra furniture, bedding, books, athletic equipment and seasonal clothing that does not fit in the small amount of space in a dorm room. College students actually start off their school year with a minimum of items, but gather more “stuff” as the school year (and years) progress. There are many college freshman school checklists that can help a new student (and their parents) prepare for the start of the school year with a minimum amount of items. The list does include under the bed storage bins, which are great out-of-the-way storage options. But, as the student accumulates more items, they will run out of storage room much quicker. Instead of having a cluttered dorm room, a great storage option is to rent a storage unit. Most self storage facilities, including Stop N Stor, rent their storage units on a month-by-month basis, which is perfect for students who are on a budget. Stop N Stor facilities offer state-of-the-art security systems giving students the peace of mind that their belongings are safe and secure while in storage. Also, Stop N Stor has climate controlled storage units, which can protect art projects, paintings, sculptures, art materials and supplies for Savannah College of Art and Design students. The climate controlled storage units also help protect musical instruments from heat and humidity damage. Stop N Stor has convenient locations for local college students in Port Wentworth on Georgia Highway 30 and Georgia Highway 21 and in and Savannah. Stop N Stor has a variety of storage unit sizes from 5’x5’ to 10’x30’ to cover any student’s storage needs. Depending on the size of the rented storage unit, students can place belongings ranging from books to loveseats in their storage unit. Storage units are perfect to store excess furniture, kitchen ware, seasonal clothing, mattresses and books. Stop by our facilities to see how we can help college students with their year round storage needs.